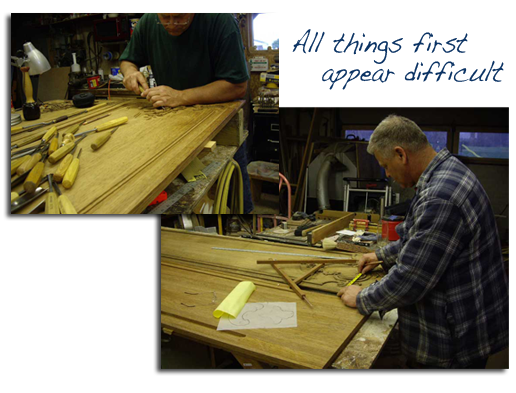 Roger has years of experience in many areas of woodworking, including chip carving, furniture making & carving, decorative art designs, and much more. Interested in a custom piece? Contact Roger anytime; he would be happy to discuss your project! As a young boy of 10 yrs. old, Roger Strautman learned to become a “do-it-yourself” work ethical person from his Grandparents, who allowed him to whittle using a knife. 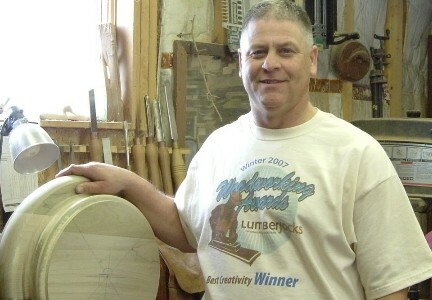 At Woodlan High School in Indiana, he had several semesters of woodworking shop during his freshman year; where one of his projects was to wood carve a ball on the inside of a box. During this time period, his interest in woodcarving began. After high school, Roger found himself in the construction business and continues in that profession today in Fort Wayne Indiana. Fort Wayne has a Woodcarvers Club, but Roger rarely attends due to availability of the daytime hours. Roger and his brother are the only woodworkers in his family, and Roger has come to find that his love, patience, eye for detail and persistence for perfection in woodworking aid him in taking more time in his occupation, fine tuning the artistic aspects of his contributions in the construction business. Roger would “love to be a woodcarver by trade when it becomes the right time, place and allowable conditions”, “but then again it would not be a hobby!” However, he does sell some small commission pieces.